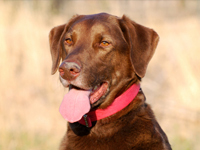 Hypo alert dogs are specially trained to recognise when their owner has low blood glucose levels, hypoglycemia. Specialist organisations, such as the UK charity Medical Detection Dogs, train dogs to recognise signs of low blood sugar and take action to prevent a medical emergency. Who could a hypo alert dog be suitable for? A hypo alert dog may be suitable for someone that has impaired hypo awareness, meaning they have significant difficulty in recognising when their blood glucose is dropping to potentially dangerous levels. If the lack of hypo awareness is having a pronounced, negative effect on that person’s quality of life, they may be eligible for a hypo alert dog. Loss of hypo awareness is more likely to develop in people dependent on insulin who have frequent episodes of hypoglycemia. How are dogs able to recognise hypoglycemia? Dogs are known to have a very keen sense of smell and the dogs are able to pick up on subtle changes of odour to detect low or high blood glucose levels. The dogs are trained to recognise different odours and are rewarded each time they pass a test. How do the dogs help to treat a hypo? Hypo alert dogs can respond to hypoglycemia in a number of ways which may include warning the owner, fetching the owner’s blood glucose testing kit or pressing a specially installed alarm in the owner’s house. Can my dog be trained to be a hypo alert dog? The dogs need to have certain temperament qualities and organisations such as the Medical Detection Dogs charity will need to meet certain criteria. Are hypo alert dogs the same as guide dogs? Hypo alert dogs have a different set of skills to guide dogs. However, it is possible that a guide dog could also be a hypo alert dog if it passed the necessary training. As hypo alert dogs play an important role in providing medical assistance and are trained to be even tempered, they should be allowed the same flexibility as guide dogs, such as being allowed in places that only accept guide dogs.